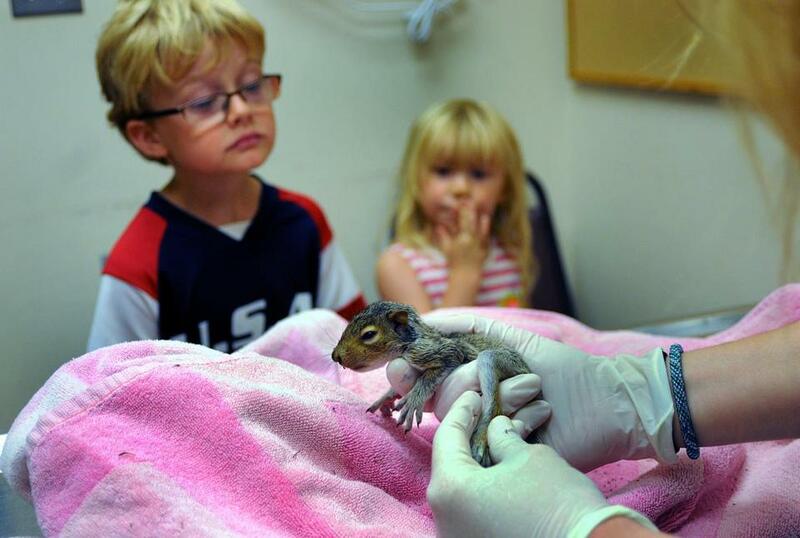 Cameron Leonard, 5, of Rockland, and his 3-year-old sister, Sarah, brought in a baby squirrel they found. On a recent Saturday between 10 a.m. and 12:30 p.m., Dr. Lisa C. Trout saw a stream of patients, one after another. They included a guinea pig, a rat, a ferret, three lizards, a sun conure, and a rooster. It was a typical shift for Trout, the newest veterinarian at the Odd Pet Vet, the New England Wildlife Center’s veterinary clinic for exotic pets. Based in Weymouth, the Odd Pet Vet is a place where creatures of all kinds — from boas to bunny rabbits, turtles to tarantulas, hamsters to hedgehogs, and even hermit crabs — can receive medical care. It’s become something of cherished institution for owners of specialty pets in Eastern Massachusetts. Dr. Gregory A. Mertz, who founded the practice in 1995, said the term “exotic” includes many species of animals, and can mean different things to different people. “Depending on your perspective, a dog might be strange,” said Mertz. The American Veterinary Medical Association’s list of exotic and specialty pets includes fish, ferrets, rabbits, hamsters, guinea pigs, gerbils, turtles, snakes, lizards, pigeons, poultry, livestock, and other birds, rodents, and reptiles. Since he started the practice 19 years ago, it has grown from a one-man operation to a thriving practice with three veterinarians and a team of vet technicians, interns, and administrative staff. With the addition of Trout, the Odd Pet Vet is now capable of providing veterinary care to exotic pets seven days a week. It also provides a boarding service. “We are definitely growing,” said Mertz. The Odd Pet Vet’s boarding service essentially serves as a kennel for all kinds of creatures; pet owners can drop off their snake or lizard to be cared for while they are away on vacation, and know that they are in good hands. This service has been growing in popularity, and the Odd Pet Vet’s revenues from boarding have risen from $9,000 in 2011 to $11,500 in 2012 and $20,000 in 2013, according to Katrina Bergman, executive director of the New England Wildlife Center. The Odd Pet Vet is a subsidiary of the wildlife center, a Weymouth nonprofit that specializes in wildlife educational programs and the rehabilitation of sick and injured animals. All fees from the exotic veterinary clinic go to support the center. Over the years, the Odd Pet Vet has treated all sorts of critters. Chinchillas. Cockatiels. Ducks. Degus. Scorpions. Spiders. They all very different, but they all share something in common — they have an owner who cares for their health. Some of the animals are sick or have broken limbs, others are perfectly healthy and simply need their nails or beak trimmed. Among the more common cases seen are animals that are overheated or dehydrated. Mertz said an owner of a bearded dragon once told him that he kept his pet in an enclosure heated to 150 degrees. “I said, whoa, wait a minute,” said Mertz, who informed the unwitting owner that the temperature for the reptile’s habitat should not exceed 90 degrees. Other animals come in with their own issues. 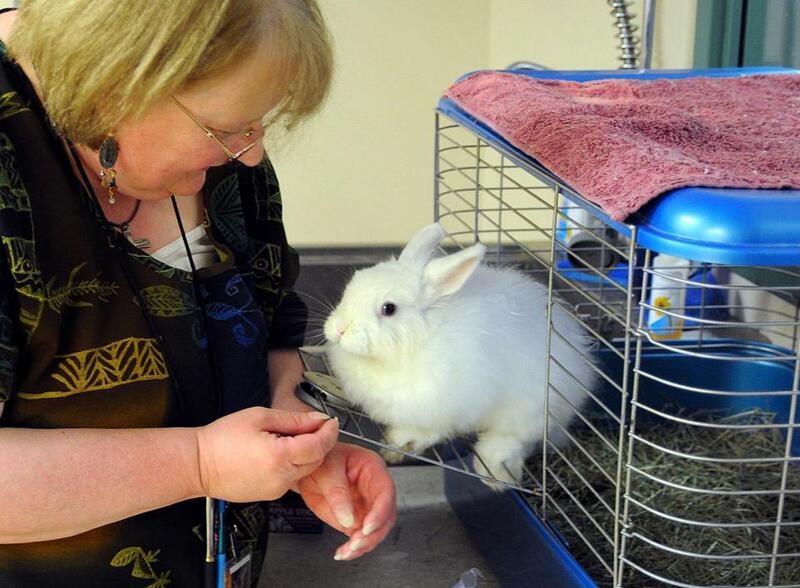 Rabbits often have problems with their teeth, rats tend to get upper respiratory infections, tumors are common in ferrets and rats, and guinea pigs are prone to vitamin C deficiency, according to Odd Pet Vet veterinarian Dr. Robert Adamski. Sometimes the ailments are preventable. The vets say that’s part of what makes this job so satisfying — they’re not only helping the pets, they’re helping the owners, too. 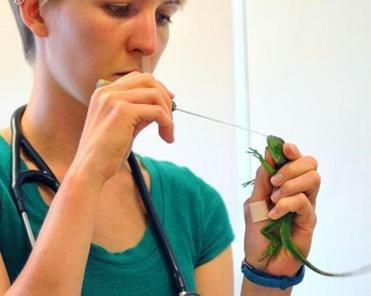 Vet Lisa Trout medicates Igster, a green Iguana from Petco in Cambridge. On the Saturday morning that Trout was on duty, she was booked with appointments. The 27-year-old veterinarian saw a rooster who needed its nails and beak trimmed. Agreen iguana named Igster came from Petco in Cambridge for a checkup. Patricia Walsh of Randolph brought her guinea pig in for a nail trim. Trout also examined a sun conure (a bird also known as a sun parakeet) named Sookie, who had been returned to a Petco in Taunton. She gently held the bird in a towel and looked over its beak and eyes and brightly colored yellow, orange, and green feathers. Pet stores will bring in returned pets for physical exams, to make sure they’re healthy, she says. 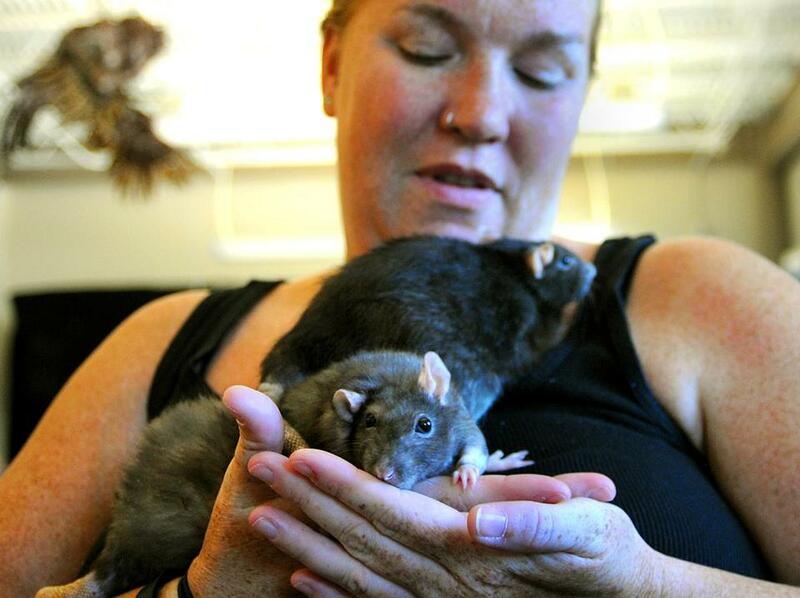 Stefanie Farrell of Millis brought in three of her pet rats — Blitzy, Thiefy, and Petunia, who recently had surgery. Thiefy had been scratching herself, and Trout said she suspected mites might be the cause. She performed what is known as a “tape test” — placing a strip of tape on the rat, then putting the tape on a slide and examining it under a microscope. Sure enough, Trout identified an ectoparasite on the slide. She treated Thiefy with a topical drug, and gave some of it to her cagemates as well, just as a precaution. Erik Knosp of Lynnfield brought in his ferret, Black, who had a skin mass on the side of his neck. Trout took a look. “He’d been scratching at it, and it had opened up and it was infected,” said Trout, who would surgically remove the infected mass the next day. Trout, who received her degree from Iowa State University in May 2013, said she grew more interested in exotic pets and wildlife in her fourth year of veterinary school. “I started to get more exposure” to different animals “and I started to realize I really loved seeing these different animals and working with them,” she said. She began volunteering at the New England Wildlife Center last fall, and officially became a veterinarian at the Odd Pet Vet on Aug. 9. She says she enjoys working with the many different species of pets, and their owners.